Yafia was a large fortified city in the time of the Jewish revolt against the Romans, and was destroyed in 67AD. Josephus Life 45: "...and came to Japha, which was the largest village of all Galilee, and encompassed with very strong walls, and had a great number of inhabitants in it". 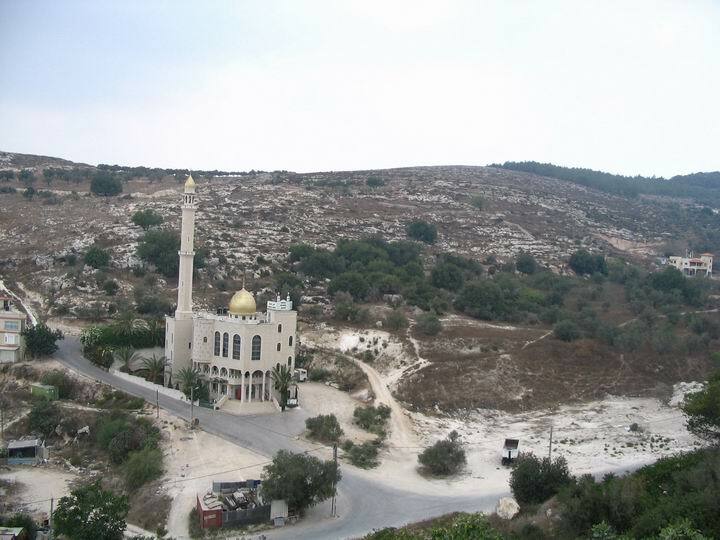 This Arab village is adjacent to Nazareth, 3KM southwest on the road to Haifa. Today it is part of greater city of Nazareth. At the Roman times, it was one of the important cities in the Galilee, fortified by Josephus. It declined after the Byzantine period. Yafia (Jafia) was under Megiddo rule at the Bronze period, and mentioned in Amarna letters, a 14th century BC Egyptian archive of clay tablets, as "Yapu". In the Bible, Yafia was one of Zevulun tribe cities (Joshua 19: 12). The location of the biblical site is not known. The ancient village of Yafia (Yafi; Joffa of the Galilee) was once one of the largest villages in the early Roman times. It gained its importance from the fact it was located on one of the roads leading to Sepphoris, the regional capital of the Galilee. On the same road was Nazareth, then a very small village and one of the satellites of Yafia. In the revolt against the Romans (67AD) the city was one of the 19 fortifications prepared by Josephus, and was totally destroyed by Titus and its population of 17,000 (quite large at that time) was butchered and sold to slavery . After the revolt the Jewish village flourished again. Today there are few remnants from the Roman times, except for a beautiful mosaic in the ancient 3rd C AD Synagogue. 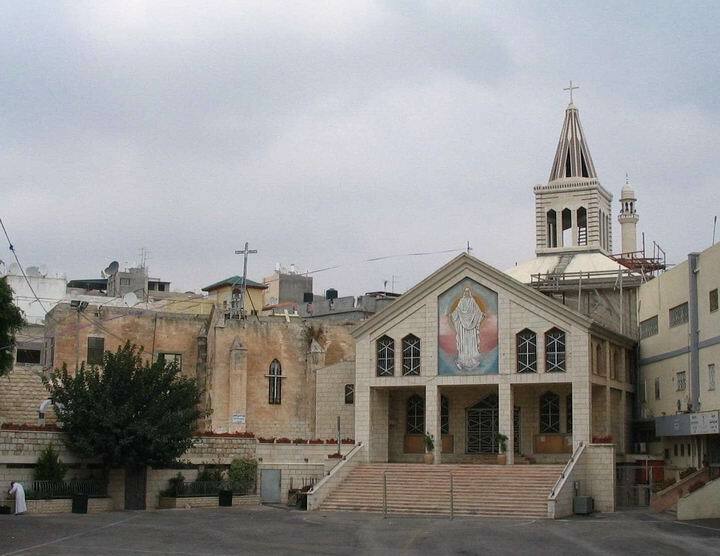 Later, in the 5th C AD, the village started to decline, since Nazareth started to gain importance on behalf of Yafia. 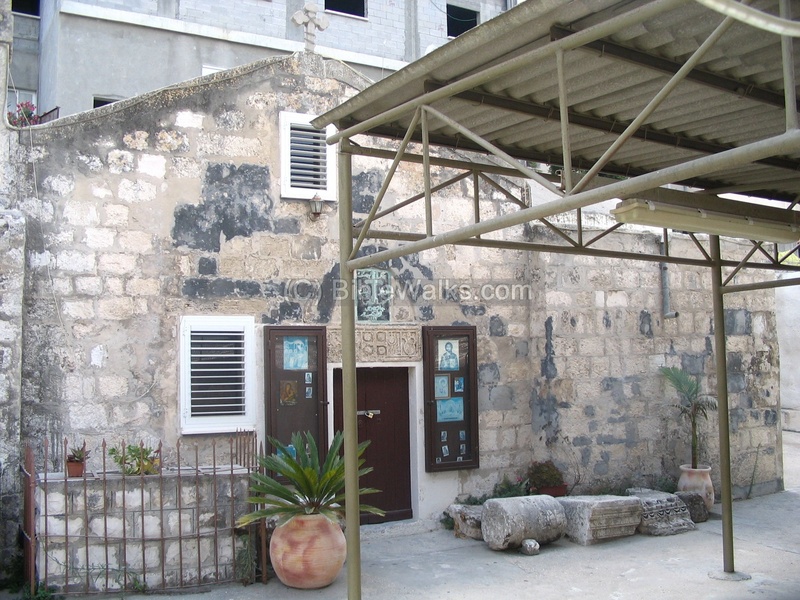 Modern village of Yafia has 4 churches in the old city on the hill of the churches, honoring the traditional birth place of Saint James (Yaakov ben Zebedee). James was one of the disciples of Jesus, a fisherman in trade and brother of John. James was martyred under Herod Agrippa as per Acts 12:2 ("And he killed James the brother of John with the sword"). The city today is an Arab village and is very congested. An aerial photo of the village is shown below. Pointing and clicking on selected points in purple will automatically scroll to the relevant photo or site. The following photo shows the Catholic church and school in Yafia, in the church zone, about 100M above the main road to Nazareth. The Greek-Orthodox church is just over the corner. It is hidden between a dense neighborhood. Above it, inside the yard of one of the houses, a magnificent mosaic was found in the ancient Byzantine synagogue. The synagogue size is 19M by 15M, its entrance faces east (towards Jerusalem), and its mosaic floor included 12 circles with the signs of the tribes, of whom 2 were found (displayed in Israel Museum in Jerusalem). The location of the ancient road from the Valley of Jezreel towards Sepphoris, passing Yafia, is not known. It is on this road that Jesus Christ may have traveled many times. However, Biblewalks.com speculates that it passed just under Yafia in the valley to the north-west of the churches. The following photo shows this road, which starts at Tell Shimron. The village of Yafia is seen in the upper left corner. Today, a mosque is built in this path, in the valley just under the village. In the background (the North side) is the direction to Sepphoris, 7KM away. 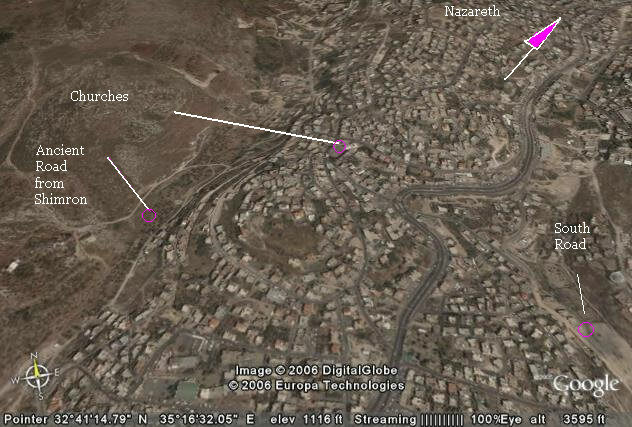 Nazareth is not seen, but is on the right (North East) side. Another ancient road may have used the south pass from Jezreel Valley south of Yafia, as seen in the following photo. In the background - Afula and the Jezreel valley. 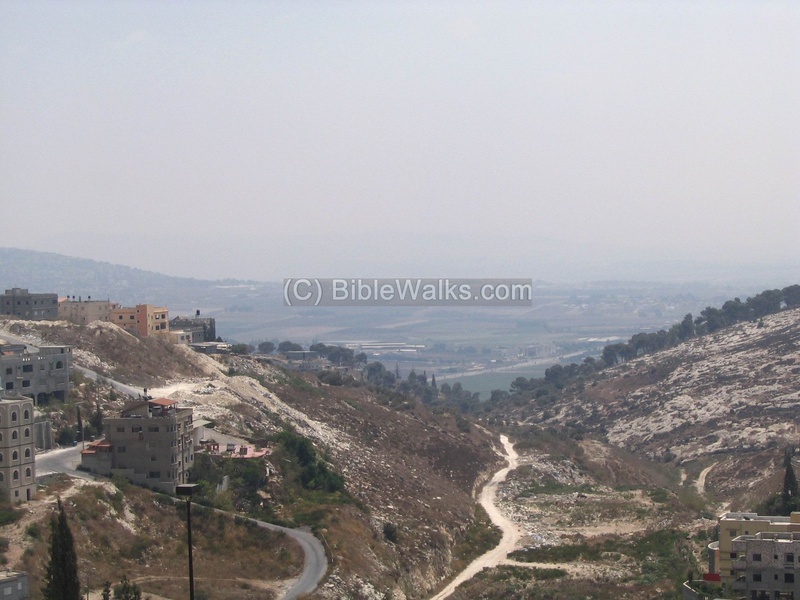 This road climbs up the steep valley south of Yafia, and joined the road from Shimron at the area of the churches. This text described the borders of the Tribe of Zebulun (Zevulun). Note that Dobrath is the village on the north-Western slopes of Mount Tabor. "And it turned from Sarid eastward toward the sunrising unto the border of Chisloth-tabor; and it went out to Dobrath, and went up to Japhia". The historian Josephus Flavius (1st C AD) was previously the commander of the Galilee army and fought against the Romans. He also lived in this town for some time (Life 52: "And when I had thus done, I went and abode at Japha"). "Josephus also, when he had settled these rules for determining causes by the law, with regard to the people's dealings one with another, betook himself to make provisions for their safety against external violence; and as he knew the Romans would fall upon Galilee, he built walls in proper places about Jotapata, and Bersabee, and Selamis; and besides these, about Caphareccho, and Japha, and Sigo, and what they call Mount Tabor, and Tarichee, and Tiberias." "When they had written this letter, they saluted the Galileans whom I sent, and came to Japha, which was the largest village of all Galilee, and encompassed with very strong walls, and had a great number of inhabitants in it." "About this time it was that Vespasian sent out Trajan against a city called Japha, that lay near to Jotapata, and that desired innovations, and was puffed up with the unexpected length of the opposition of Jotapata. This Trajan was the commander of the tenth legion, and to him Vespasian committed one thousand horsemen, and two thousand footmen. When Trajan came to the city, he found it hard to be taken, for besides the natural strength of its situation, it was also secured by a double wall; but when he saw the people of this city coming out of it, and ready to fight him, he joined battle with them, and after a short resistance which they made, he pursued after them; and as they fled to their first wall, the Romans followed them so closely, that they fell in together with them: but when the Jews were endeavoring to get again within their second wall, their fellow citizens shut them out, as being afraid that the Romans would force themselves in with them. It was certainly God therefore who brought the Romans to punish the Galileans, and did then expose the people of the city every one of them manifestly to be destroyed by their bloody enemies; for they fell upon the gates in great crowds, and earnestly calling to those that kept them, and that by their names also, yet had they their throats cut in the very midst of their supplications; for the enemy shut the gates of the first wall, and their own citizens shut the gates of the second, so they were enclosed between two walls, and were slain in great numbers together; many of them were run through by swords of their own men, and many by their own swords, besides an immense number that were slain by the Romans. Nor had they any courage to revenge themselves; for there was added to the consternation they were in from the enemy, their being betrayed by their own friends, which quite broke their spirits; and at last they died, cursing not the Romans, but their own citizens, till they were all destroyed, being in number twelve thousand. So Trajan gathered that the city was empty of people that could fight, and although there should a few of them be therein, he supposed that they would be too timorous to venture upon any opposition; so he reserved the taking of the city to the general. Accordingly, he sent messengers to Vespasian, and desired him to send his son Titus to finish the victory he had gained. Vespasian hereupon imagining there might be some pains still necessary, sent his son with an army of five hundred horsemen, and one thousand footmen. So he came quickly to the city, and put his army in order, and set Trajan over the left wing, while he had the right himself, and led them to the siege: and when the soldiers brought ladders to be laid against the wall on every side, the Galileans opposed them from above for a while; but soon afterward they left the walls. Then did Titus's men leap into the city, and seized upon it presently; but when those that were in it were gotten together, there was a fierce battle between them; for the men of power fell upon the Romans in the narrow streets, and the women threw whatsoever came next to hand at them, and sustained a fight with them for six hours' time; but when the fighting men were spent, the rest of the multitude had their throats cut, partly in the open air, and partly in their own houses, both young and old together. So there were no males now remaining, besides infants, which, with the women, were carried as slaves into captivity; so that the number of the slain, both now in the city and at the former fight, was fifteen thousand, and the captives were two thousand one hundred and thirty. This calamity befell the Galileans on the twenty-fifth day of the month Desius [Sivan.]" 1950 Prof E. Sukenik (famous finder of Dead Sea Scrolls; father of Yigal Yadin ) - unearthed the beautiful mosaic in the Synagogue, just above the Greek-Orthodox church. Israeli Antiquities Authority (Digs archives, Hebrew)- In 2006 a limited emergency excavation on the eastern slopes of Yafia revealed early periods: Mid Bronze, Late Bronze, early Iron age. Earlier excavation unearthed Roman/Byzantine and later periods, including the Synagogue. Yafia means in Hebrew a remarkable, beautiful place. Kibbutz Yifat is a few kilometers to the south-west, and is named after this ancient city.